We both bought these scooters for $800, which was a limit for the purchase. 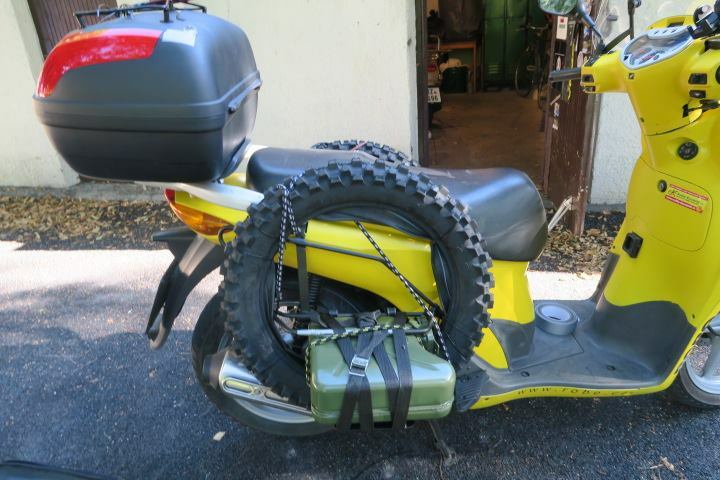 The scooter from hynek was bought from a customer of Scootland, who purchased a bigger one and its life was not easy. One year of duty in the service in Prague as a spare scooter for customers and then another year in Hynek's hands in Brno. Scooter from Radek was bought for the purpose of this trip. The price was low, as we bought it in January. The testdrive was on ice and luckily without accident :) Here is a first picture, with chef mechanic of Scootland Petr. Because load capacity was not sufficient, guys in Scootland made us side racks. To them, we bought bags from a chinese market ($8 each) and we were ready for big loads. Compared to the last post, we added holders for canysters, now we can carry extra 10litres of fuel. On upper side of the rear box we also put a holder for sleeping bag and tent. After watching of serveral documents from travellers going to Aral lake we saw that it would be quite problematic to go in sand with loaded scooter on the slim rear tire. The ability to fit on the offroad tires was one of the requirements, thats why we have chosen Honda SH. Tires fitting was tested in winter, before Radeks scooter was even bought. We wanted same yellow colour (Scootland), but did not want to spend so much money and avoid classical way of repainting the whole scooter. Folie is not ideal, as the shape of scooter is quite complicated and we were not able to do this ourselves. Finally we went for PlastiDip, which is a sprayed rubber surface, which you can also remove easily. First paint looks not that good, but the second one was quite allright. The price for a repaint of whole Honda was around $60 each. vario weights and sliders are different as Hynek uses Malossi Multivar and Radek the stock vario. On Radek's Honda, we changed the rear shocks and when I saw the difference, I ordered them as well. They came one day before our departure (uff), so in the end all good. Here is a short movie in Czech from the service. We installed 12V plugs, one in front of knees to recharge the phone /navigation, the other one in the rear luggage box to recharge laptop and camera.